Athletes need to be skilled and fast, coaches strategic: three of many characteristics the sport of GRID proved us so far. Imagine you have a race ahead, combined of elements from sports like gymnastics, track and field, weightlifting, strongman and powerlfiting. Rules given include the number and gender of athletes you can use. You also have 14 athletes, seven men and seven women, with who you operate. And you want to win. To create a team with athletes who are good at everything? Or pick out the players who are skilled and specialized in one aspect of human performance? Team work comes first. You win with the strategy of creating the best possible athlete race-combo: putting together the players who complement each other with their high-level developed skills. This is GRID, team sport where two teams compete head-to-head in a two-hour match. National Pro Grid League (NPGL), the governing body of the sport GRID, was formed in 2014 and it’s now running its second season. DC Brawlers won the GRID Championship in 2014. New season already kicked off with first three matches in the mid June. 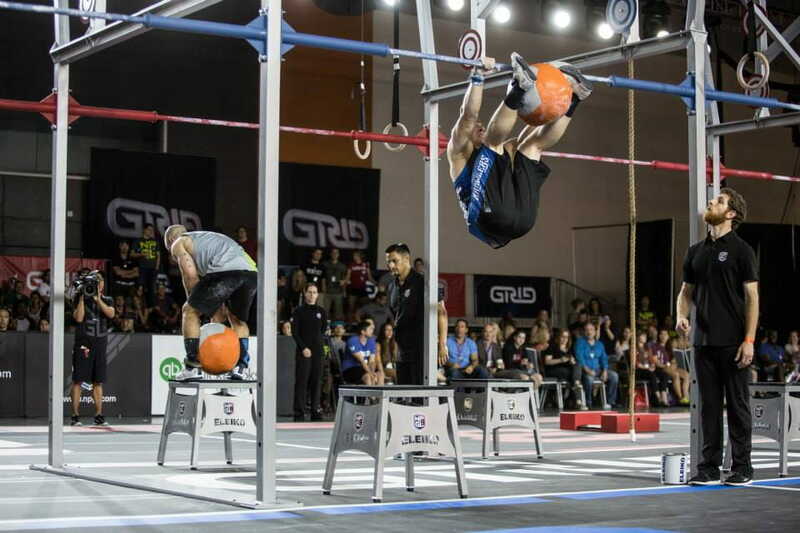 GRID athletes are specialized in one field, whether gymnastics, athletics or weightlifting. The highlight this year was definitely the arrival of Dmitry Klokov who was signed up by Baltimore Anthem. Each match offers astonishing performance by its players. And this leads to our list of hardest or most tricky elements (exercises combinations) we’ve seen so far in the sport of GRID. Two gymnastics skills on the rings, put together to form one complex: muscle-up (pull-up, transition, dip) and a back uprise (swing, transition). Cliff Kohut, the New York Rhinos player, makes this complex look easy. The regular, well-known pistol squats were upgraded with a barbell holding overhead. And if you thought double-unders can’t get more tricky? Try adding some weight to your jump rope. This exercise combination was race 1 and part of the match named Washington. The comfort of placing your feet to the wall is removed, athletes must keep the balance and vertical control throughout the movement. Freestanding deficit handstand push-ups were part of McKinley, the match which was the opening of 2015 season. Kris Clever during freestanding deficit HSPU. Sounds simple? Not if you keep missing the 10-foot (3 meters) high target. Elijah Muhammad from New York Rhinos was definitely the best possible player for this element (6:07 on). The movement begins with an athlete in a standing position. At the bottom chest must make contact with the ground. After the player rises back up, he or she must jump and make a contact with a ring. Made our list not due to the skill difficulty, but the weight used. This was a perfect race element for no other than a 33-year-old Danny Nichols, the powerhouse of Phoenix Rise. As a reminder, he carries 113 kg in each hand. Farmers carry were part of Washington’s race 11. 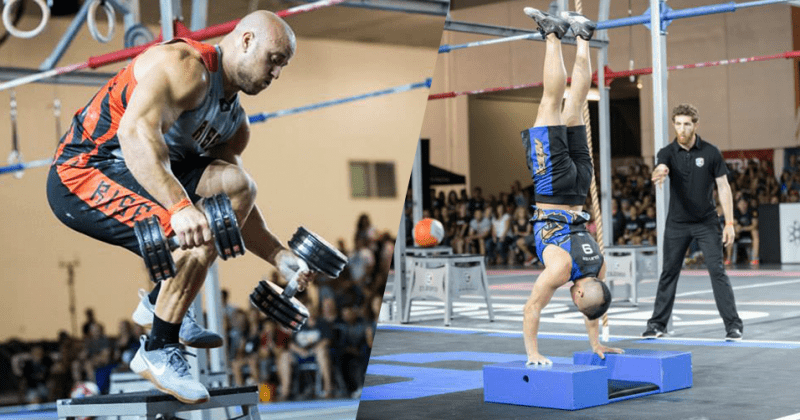 Social media was recently flooded with a video of Eric Cardona sprinting through 12 (in a row) backwards roll-to-support. Eric is a former gymnast who competed and even won a gold medal at junior nationals. 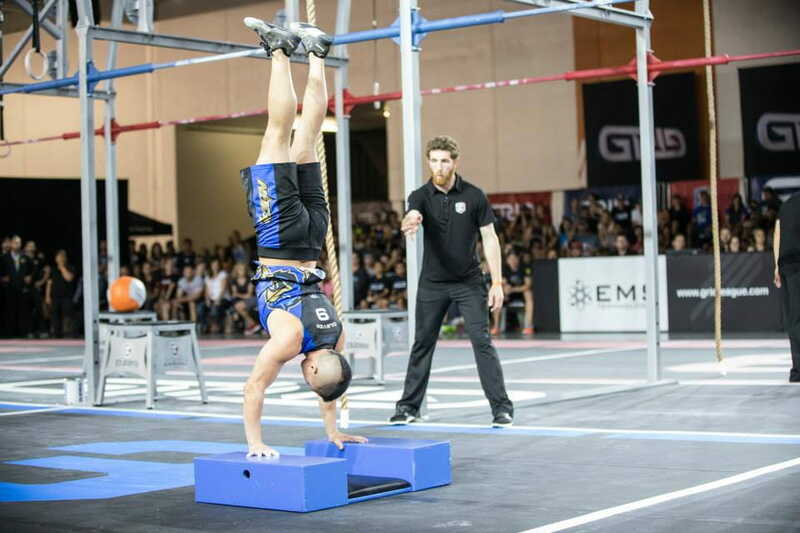 In NPGL he competes for San Francisco Fire: Eric empowers his team as a body-weight specialists. Imagine not only doing a pistol squat, but also a (pistol) lateral jump. Pistol stick jump-overs are coupled with kettlebell ground-to-overhead in race 1 of McKinley. Highest height to jump over is 61 cm (24″) for men and 50 cm (20″) for women. Kona, a new match format, has be announced recently for the upcoming combats in August. Gridders will face strongman elements stone-over-shoulders and stone-over-box. Women’s weights will go up to 57 kg and men’s will end at 113 kg. Call Danny Nichols? Stones, which actually look like a giant med ball, will weight 91 kg (200 lbs) for stone-over-box. Out of all the new Eleiko equipment available for NPGL matches, those giant-med-ball-like stone definitely look like most fun. Ashley Beaver (@livinpaleo) throwing around a 100-lb @eleikosport med ball at the #NPGLCombine. Regular toes-to-bars are out, T2Bs with a twist “are the new black”. Whether NPGL put them in a complex or adds some weight. If you could choose: medicine ball or sandbag? Athletes need to hold the extra weight with their feet and bring it to the bar (make contact in the area between the hands). A complex with toes-to-bar and chest-to-bar made its debut at the Combine. The exercises alone are not demanding, but the altering combination makes it tricky. Race 8 — Jack and Jill starts out with 40 alternating toes-to-bar/chest-to-bar. This is one of the new elements being tested out at the #NPGLCombine. Which one you liked most? Let us know and comment below.